This week I painted the five sectors with subsectors to emphasize the fact that every primary phase of the whole seems like the whole to those who live in it… also it’s colourful and stimulating – fractal is like nature and more beautiful than uniform blocks. . This is a big leap forward in the ergonomics of the 4phase process approach to meetings. Around this five-part table people can find their ‘home sector’ and really get how they fit with the other sectors in the process of creating new ideas, of coming to new mutual understandings and synergies. 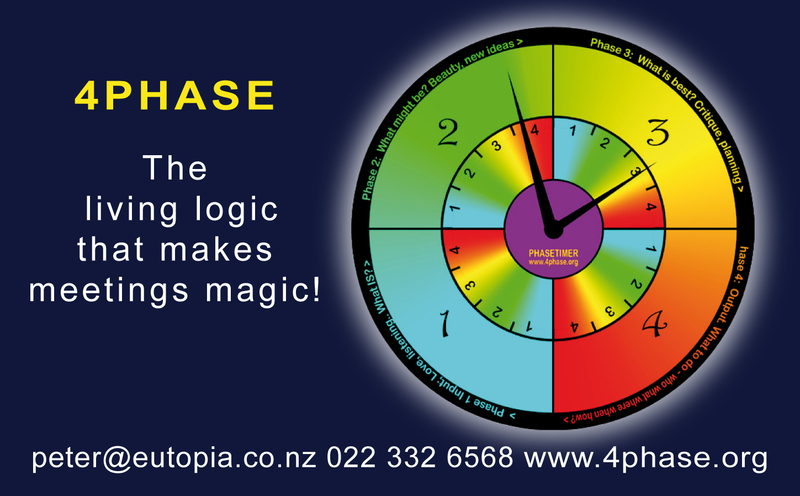 Our grandsons shown here playing with the prototype sector ‘wands’… The sector tables may get imprinted with some graphics to represent four sub-phases within them – each phase is a process world to itself, with inputs and outputs, novelty and logic..
Here’s my latest graphic in the alarmclock I got on special for about $12. I added hours around the purple circle in case the clock is also wanted for use as a chronometer! It only takes unscrewing the legs of this model and you can replace the face with a printed one as I did… I printed it on 250 gsm plain card , colour inkjet. Here’s the jpeg I printed it from in photoshop, using the print to a custom size option. in this case 105 mm. I used a leather punch to make the central hole – nice and neat. 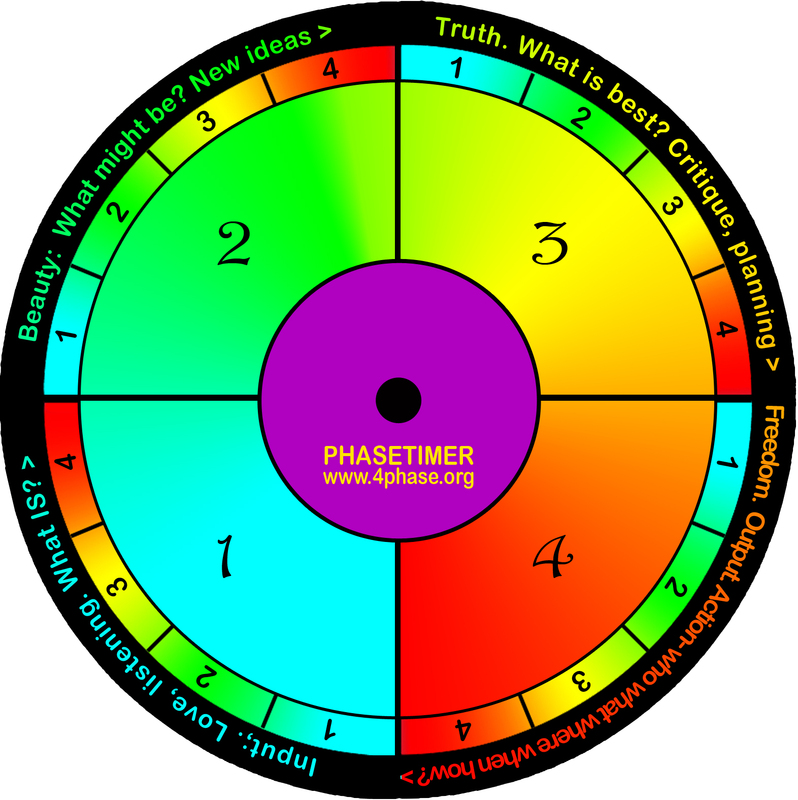 Use this, free, to make your own phasetimer! As Zarathustra says to the prophet of the great weariness, ‘There ARE still Blessed Isles!’ I look forward to helping myself and others to go there – and stay! 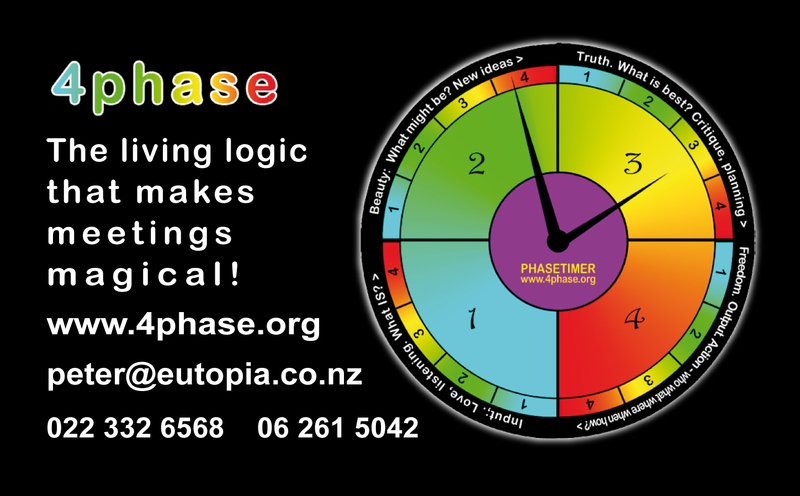 Phasetimers with two levels – free graphic within! 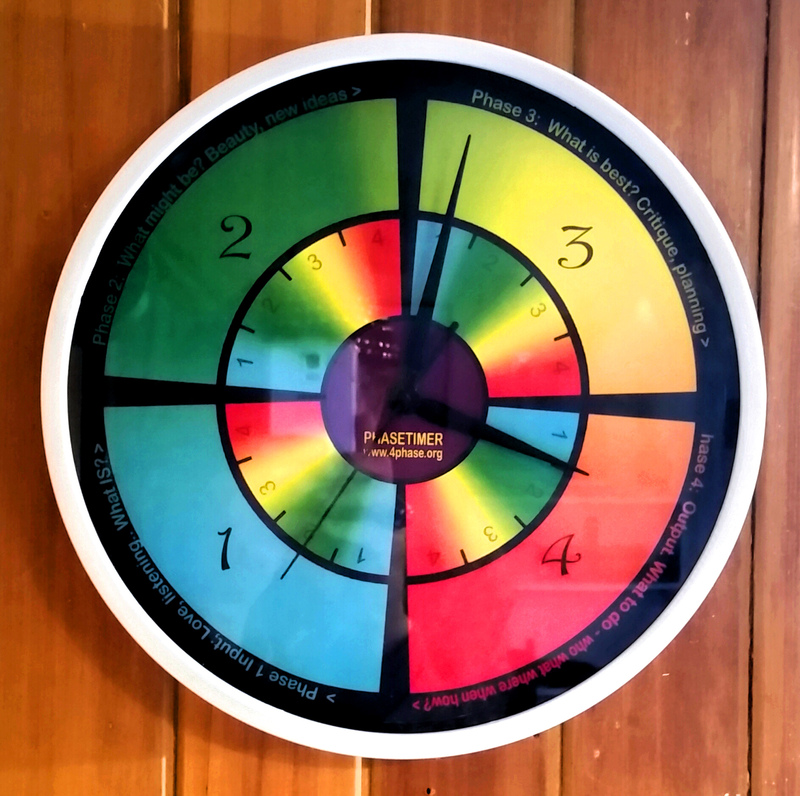 This is my latest (04 10 15 ) Phasetimer prototype (white frame because shop had no black), with an inner band for timing shorter cycles of four phases – fifteen minutes to go through a cycle, or 3.75 minutes per phase. 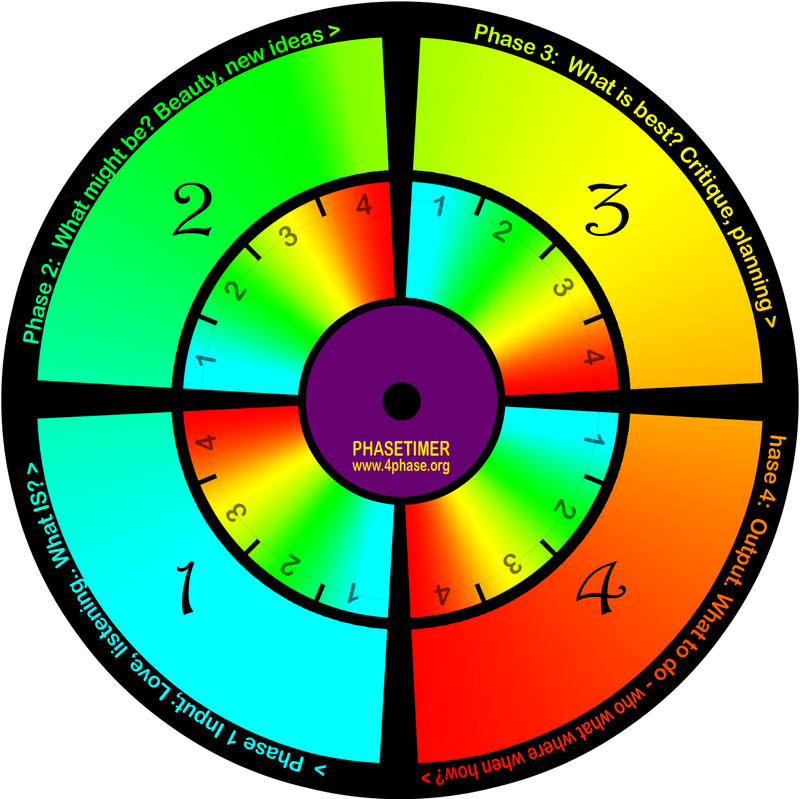 This is for quick processing a question – also can be used to go through four cycles in an hour…iterations are of course all part of process and evolution.